This study estimates the net cost benefit of outsourcing cleaning services in a hospital in Uganda. The aim is to demonstrate an approach that can be applied by hospital managers using readily available data to conduct a cost benefit analysis as part of pre-sourcing evaluation. A before and after design was used to analyze, from the hospital manager’s perspective, the impact of outsourcing cleaning services on the hospital’s costs. Cost and service quality data was collected for the pre- and post- outsourcing period. Net costs of outsourcing were determined using a total cost pre- and post-out-sourcing approach. Benefits were monetized by comparing the costs of outsourcing with the theoretical in-sourcing costs that would be required to achieve the same quality as outsourced cleaning services. The theoretical in-sourcing costs were estimated by weighting the actual insourcing costs by a quality factor based on the hospital manager’s rating of service quality pre- and post-outsourcing. The outcome measures were the net total cost and cost per square meter cleaned for a one-year period. Before adjusting for quality, outsourcing cleaning services were more costly than insourcing, with an annual cost of UGX 644.35 ($ 0.25) and UGX 568.07 ($ 0.22) per square meter cleaned, respectively. After adjusting for quality, outsourcing is cost-beneficial, providing a cost saving of UGX 372.20 ($ 0.14) per square meter cleaned. Sensitivity analysis indicates that cost of the outsourcing contract and manager’s quality rating of outsourced services have the greatest impact on value for money from outsourcing. An annual contract cost above UGX 1000 ($ 0.38) per square meter cleaned makes outsourcing less beneficial, keeping all other factors constant. An average quality rating below 5 for the outsourced service makes outsourcing less beneficial cost wise. Outsourcing resulted in additional hospital expenditure compared to in-sourcing, but also resulted in better quality service. Adjusting for quality makes outsourcing more cost beneficial. The magnitude of the cost benefit is sensitive to the contract value and the managers’ quality rating of the outsourced services. Keywords: Cleaning services, Cost-benefit analysis, General hospital, Rural hospital, Outsourcing, Uganda. © 2018 Mujasi and Nkosi. Outsourcing involves using an outside company to provide a non-core service previously performed by staff [1Gottschalk P, Solli-Saether H. Critical success factors from IT outsourcing theories: An empirical study. Ind Manage Data Syst 2015; 105(6): 685-702. [http://dx.doi.org/10.1108/02635570510606941] ]. The organization does this in order to maximize service, optimize expertise, minimize cost and to maintain or improve quality [2Blouin AS, Brent NJ. Outsourcing legal services in healthcare. J Nurs Adm 1999; 29(11): 18-20. [http://dx.doi.org/10.1097/00005110-199911000-00006] [PMID: 10565315] ]. Hospitals provide a broad and complex range of services. Some of these services can be purchased from other institutions. This makes hospitals a suitable environment for outsourcing [3Liu X, Hotchkiss DR, Bose S, et al. Contracting for primary health services: Evidence on its effects and framework for evaluation 2004.]. Over the last decades, the hospital sector in developed countries has been under pressure both from demographic changes and increasingly scarce financial resources. The hospital sector has responded by outsourcing non-core services like IT services, catering and cleaning [4Augurzky B, Scheuer M. Outsourcing in the German hospital sector. Serv Ind J 2007; 27(3): 263-77. [http://dx.doi.org/10.1080/02642060701207080] ]. Benefits of such outsourcing efforts have included lower costs, reduced number of personnel, improved quality and higher levels of satisfaction with services provided by the hospitals [5Rahimi B, Mizrahi R, Magnezi R. The challenges and opportunities of implementing outsourcing in private and public hospitals in Israel. Harefuah 2011; 150(1): 56-60, 66. [PMID: 21449159] ]. Given that many developing countries like Uganda are beginning to feel the very same pressures faced by industrialized countries [6Health Sector Strategic and Investment Plan 2010/11-2014/5 2010. ], outsourcing is one strategy that hospitals can adopt to improve efficiency and management. In Uganda, the Government of Uganda policy on Public Private Partnership for Health (2009) and the Government of Uganda National Public Procurement and Disposal Act (2003) provide hospitals with an opportunity to use outsourcing as a strategic management tool to manage costs while improving quality. Results of the studies on the costs and benefits of outsourcing have always been mixed. Studies on outsourcing health services from Zimbabwe, South Africa, and Cambodia showed that outsourced providers can deliver the same quality of service at lower unit costs than their public sector counterparts [7Patouillard E, Goodman CA, Hanson KG, Mills AJ. Can working with the private for-profit sector improve utilization of quality health services by the poor? A systematic review of the literature. Int J Equity Health 2007; 6: 17. [http://dx.doi.org/10.1186/1475-9276-6-17] [PMID: 17988396] -9Private SPO. Primer for Policymakers Contracting-out Reproductive and Family Planning Services: Contracting Management and Operations May 2006 Retrieved April 15 2006.https://www.k4health.org/sites/default/files/Primer%20for%20policymakers.pdf]. Other studies, however, have shown that outsourcing does not always deliver high quality, low-cost service. In Tunisia for example, several university teaching hospitals outsourced their catering and cleaning services, resulting in better quality of services but at a higher price [10Perrot J. The Role of Contracting in Improving Health Systems Performance 2004; 62.]. In a Jamaica hospital, outsourcing cleaning and pottering services resulted in improved quality of services but at 25 percent higher costs [11Mills A, Broomberg J. Experiences of contracting health services: An overview of the literature 1998; 60.]. Thus, the decision to outsource should be based on others, on a careful evaluation of the potential costs and benefits. However, managers need simplified and practical approaches that use readily available data for such an evaluation. A comparative analysis of the costs and benefits of outsourcing cleaning service in a rural hospital in Uganda was conducted to test if the economic argument for outsourcing (i.e. reduced costs) holds true for the selected service in the selected hospital. This entailed an evaluation of the monetary costs and gains of outsourcing the cleaning service relative to providing the cleaning services in-house (in sourcing). The objective of the study was to analyze the costs and benefits of outsourcing cleaning services at a rural hospital in Uganda by: (1) determining a baseline cost of in- sourcing the cleaning service (2) determining the cost to the hospital of outsourcing the cleaning service to a private vendor (3) conducting a qualitative service quality assessment to determine changes in quality of the outsourced services as perceived by hospital management and generate a ‘benefit’ metric from outsourcing (4) comparing the raw and quality adjusted costs for in-sourcing and outsourcing of cleaning services in the selected hospital. The study demonstrates an approach that can be applied by hospital managers using readily available data to conduct a cost benefit analysis as part of pre-sourcing evaluation. The study hospital is a 169-bed rural Non-Government Organization (NGO) hospital. At the time of the study, the hospital had a staff strength of 169 (106 clinical staff and 38 non-clinical staff). The hospital sits on about 19 acres of space (76,890.34 square meters). In the 2013/14 financial year (the year of study), the hospital had an annual operating budget of approximately UGX 3,509,805,896 ($1,349,925), attended to 25,000 outpatients and admitted 11,000 inpatients that year. This was a cost-benefit analysis of outsourcing cleaning services in a rural hospital in Uganda using a before and after design. The costs and benefits of outsourcing were analyzed from the hospital manager’s perspective. The primary outcome measure was net total costs or annual cost per square meter of the hospital cleaned. Thus, the study focused on analyzing the value for money of outsourcing to hospital managers based on its impact on hospital budgets and the quality of services provided. The analysis covered a year period (2014 to 2015), to allow capturing benefits from outsourcing that may accrue in the short term, such as improvements in the quality of cleaning. This analysis assumes that real costs, such as the cost of personnel, equipment, supplies, and utilities, remain constant throughout the analysis period. The reference was in-house provision of the cleaning services using the hospitals own staff (in-sourcing). The hospital had been outsourcing the cleaning services since 2012 two years before the analysis year (2014). All costs and benefits were converted to 2014 Uganda shillings. Data was collected through a two-stage process. An initial face to face interview was conducted with the Hospital superintendent to learn about the hospital’s outsourcing program including reasons for outsourcing, the outsourcing process and level of satisfaction with the outsourced services. As a follow-on, the hospital superintendent was sent a data collection form to provide financial and other data. The form collected data on the costs of the outsourcing contract, number, salary and benefit information for the cleaning staff prior to outsourcing, salary and benefit information for management staff involved in the management of the cleaning services (both before and during outsourcing); an estimate of management time spent in supervising the cleaning services (both before and during outsourcing) and the costs of utilities, consumables and other supplies used for the cleaning (both before and during outsourcing). The form also collected data on the quality rating of the cleaning services prior to and during outsourcing from the key managers with oversight responsibility for, or benefiting from the cleaning services (Medical superintendent, Hospital Administrator, Chief Nursing Officer and Customer Care Assistant). The quality ratings were collected using a Likert scale of 1 to 10, with 1 being lowest quality and 10 the highest quality. There are two categories of costs associated with providing the cleaning services in the study hospital: direct costs and indirect costs. These are detailed in Table 1. Direct costs include personnel costs, supplies, equipment and the costs of the outsourcing contract. The indirect costs include training costs for the cleaning staff, hospital management costs to supervise or provide oversight for the cleaning services and the costs of operations. Cost categorization for outsourcing and in-sourcing. With outsourcing, the contract covers the direct costs that the hospital incurred when it was in-sourcing. However, there are additional indirect costs that hospital continues to incur when outsourcing. For example, the hospital still needs to cover utilities and the salary of a hospital manager who oversees and monitors the vendor’s work. These indirect costs are in addition to the contract value. Costing for this analysis was conducted using a total cost approach, whereby all indirect and direct costs of each alternative were identified and quantified with a monetary value. The data reported by the hospital managers in the data collection tool was used to determine the breakdown of the in-sourcing and the outsourcing alternatives. Operational costs and costs of supplies were provided by the hospital management as aggregate/ total costs for the periods of interest. Details of unit prices and quantities were not available. Since costing data for the two alternatives considered under this analysis (outsourcing vs in-sourcing) were collected for different time periods (i.e. the contract costs for 2014 for the outsourcing and the in-sourcing costs for 2012 (the last year before the outsourcing program begun two years ago), the costs are expressed in 2014 constant UGX and 2014 constant United states dollars for comparative purposes. To account for the time difference between the current study period and when the hospital last provided the cleaning services in-house (2 years ago), the study applies an inflation rate to the last costs reported to have been incurred by the hospital when in-sourcing to account for changes in prices. The Uganda Bureau of Statistics’ Composite Consumer Price Index (CPI) changes from 196.43 in 2012 to 216.05 in 2014, indicating a CPI change of 20.17, or 10% [12Consumer Price Index http://www.ubos.org/statistics/indices/consumer-price-index/]. Thus an inflation rate of 10% was applied to the 2012 costs to determine the 2014 costs. There are a number of benefits of outsourcing cleaning services in a hospital setting. These include tangible benefits such as improved quality of cleaning service and cost savings on personnel, supplies, equipment, training and management costs to supervise the cleaning. Intangible benefits include reduced management supervision effort, improved adherence to cleaning guidelines, potential reduction in hospital acquired infections and experience gained by hospital management in dealing with the private sector. These benefits include both quantitative and qualitative benefits. For simplicity, the study considered only two types of benefits in the analysis: financial cost savings and overall quality of cleaning services. 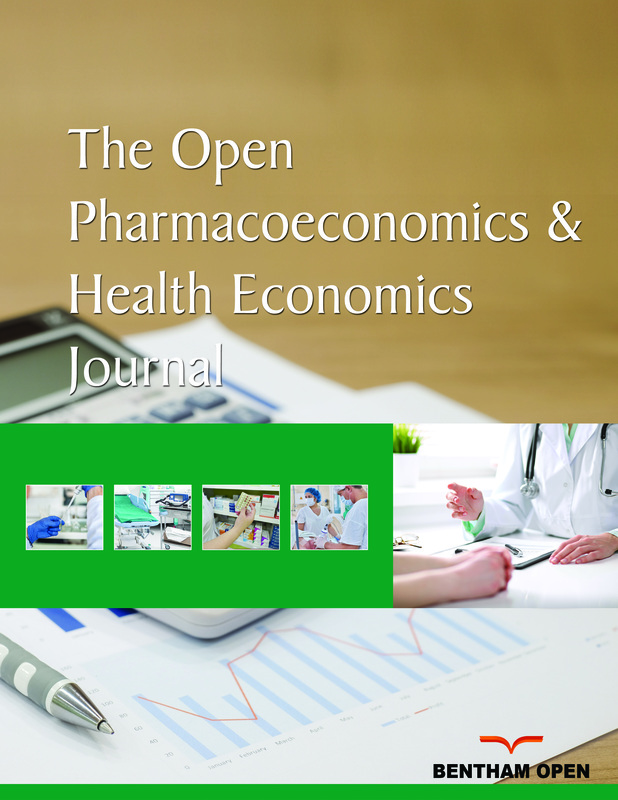 Key approaches for monetizing qualitative benefits of an intervention include measuring a consumer’s willingness to pay for a theoretical service and calculating the cost avoidance resulting from an intervention [13Cellini SR, James Edwin Kee JE. Cost-Effectiveness and Cost-Benefit Analysis.Handbook of Practical Program Evaluation 493-530 3rd ed. 3rd ed.2010., 14Olsen JA, Smith RD. Theory versus practice: A review of ‘willingness-to-pay’ in health and health care. Health Econ 2001; 10(1): 39-52. [http://dx.doi.org/10.1002/1099-1050(200101)10:1<39::AID-HEC563>3.0.CO;2-E] [PMID: 11180568] ]. In our study context, estimating willingness to pay would involve asking a large sample of hospital managers for the maximum Uganda Shillings amount they would be willing to pay for a hypothetical increase in the cleanliness of a hospital. The monetary value obtained from this survey would then be tallied as a benefit of outsourcing cleaning services, assuming that outsourcing resulted in an increase in the quality of the service and thus the cleanliness of the hospital. Measuring cost avoidance would entail estimating the monetary value of each of the intangible benefits earlier mentioned, for example, one could estimate the reduction of hospital acquired infections resulting from the improved cleanliness of the hospital and time savings resulting from reduced management burden in supervising the hospital cleaning staff. The monetary values of infections avoided and time saved could then be modeled and included as benefits of outsourcing. The willingness to pay and cost avoidance approaches are resource- and time-intensive, and would require broad assumptions to be made with limited information and thus were not feasible. Thus, we adopted a simplified but practical approach of quantifying the financial cost savings from outsourcing that entailed a comparison of the direct and indirect cost categories under outsourcing and in sourcing. The cost saving is equal to the difference between the costs under each alternative considered (outsourcing Vs in-sourcing). To account for the differences in quality between outsourcing and in sourcing; based on the average quality ratings provided by the hospital managers for the cleaning services before and during outsourcing, the costs of insourcing are weighted by a quality factor to recalculate the cost savings of outsourcing compared to insourcing as “quality adjusted” cost savings. This assumes that better quality service provides higher value. Weighting the costs based on observed quality, inflates the cost of lower-quality services, reflecting the hidden costs of an inferior service. The relationship between cost and quality is equivocal, in some cases positive, in others negative. In our case, we assumed a positive linear relationship mainly because improvement in the quality of cleaning services is likely associated with use of better equipment and cleaning methods which are likely to require more investment and hence a higher cost for the quality. The study assumed that the quality-adjusted scores represented management’s willingness to pay for better quality services. The hospital managers on average rated the quality of the outsourced cleaning services at 8.5 compared to an average of 4.75 for the in-sourced service, indicating that from their perspective, the outsourced services were of a superior quality. Using quality adjusted costs allowed assessment of the value for money of outsourcing as compared to in-sourcing, taking into account the superior quality of outsourced services. The quality-adjusted costs are notional for comparing the value for money of outsourcing and in-sourcing for the cost benefit analysis. They do not reflect the real financial costs of the alternatives (outsourcing Vs In-sourcing). The quality-adjusted cost savings were calculated by subtracting the actual costs of outsourcing from the quality-adjusted costs of in sourcing. The collected data was entered into an Excel spreadsheet for manipulation, analysis and presentation. The study assumed that costs of the outsourcing contract and staff payments would be paid within the year of study; and that benefits would also accrue in the same year. The unadjusted and quality adjusted costs of providing the cleaning services were calculated under the alternatives considered during the study period. The primary outcome measure was the total net cost or cost per square meter of the hospital cleaned. To enable comparison of the costs of in-sourcing and outsourcing, the 2012 in-sourcing costs (the last year of outsourcing) were converted to 2014 constant UGX by applying the inflation rate of 10% earlier mentioned. Two-way sensitivity analyses were conducted for the key assumptions in the study. The effect of increasing and decreasing the costs of operations and management by 20% each, on the quality-adjusted total net cost of out sourcing were analyzed. The effect of varying the hospital management’s quality rating of the outsourced service and the effect of varying the cost of the outsourcing contract were also analyzed. Table 2 below compares the annual costs of outsourcing and in-sourcing for the period under study. The table shows that the hospital’s expenditure on outsourcing cleaning services is higher than insourcing, both for the whole year and per square meter of hospital area cleaned. The table shows that before adjusting for quality, the hospital spends UGX 644.35 ($ 0.25) per square meter cleaned while outsourcing compared to UGX 568.07 ($ 0.22) while in sourcing. With outsourcing, the outsourcing contract covers the direct costs that the hospital incurred when it was insourcing. However, the hospital continues to incur some additional indirect costs; for example, costs to cover utilities and the salary of a hospital manager who oversees and monitors the vendor’s work. These indirect costs are in addition to the contract cost. The table also shows that with outsourcing, the direct costs (contract value) covers 97% of the cleaning costs with indirect costs (management and operation) covering the remaining 3%. With insourcing, personnel costs cover 82% of the cleaning costs. The proportion of indirect costs (management and operational costs) while insourcing is higher than outsourcing (11% vs 3%). While outsourcing, the hospital does not have to pay for training costs since these are covered by the vendor. Comparative annual costs of outsourcing and in-sourcing. Table 3 compares the costs of outsourcing and insourcing after adjusting for the differences in the quality of cleaning services delivered through the two alternatives. These costs reflect the hidden costs of poor-quality services revealed by applying the quality adjustment described in the methods section. Results show that for the study hospital it costs more to deliver the same quality of cleanliness when insourcing than when outsourcing. Quality-adjusted annual costs of outsourcing and in-sourcing. After adjusting for quality, it costs UGX 1,016.55 ($0.39) to clean each square meter of the hospital while insourcing, compared to UGX 644.35 ($ 0.25) while outsourcing. The poor rating of in-sourced cleaning services by the hospital managers accounts for this difference in cost. Two cost-benefit analyses of outsourcing are presented in Table 4 below; before and after adjusting for the costs of poor quality of cleaning services while insourcing. Before adjusting for quality, the net cost of outsourcing over a year study period is UGX 5,865,080 higher than the net cost of insourcing. This means that the management of Hospital A incurred UGX 76.28 more per square meter cleaned during the study period by choosing to outsource the hospital cleaning services. Taking into account differences in quality of insourced and outsourced cleaning services, the net total cost saving from outsourcing over the one year study period is UGX 28,618,356.84 ($ 11,007.16), translating to a total net cost saving of UGX 372.20 ($ 0.14) per square meter of hospital space cleaned. This implies that taking into consideration improved quality of cleaning, the hospital management gained approximately UGX 28,618,356.84 ($ 11,007.16) in total value over the one year period by outsourcing cleaning services. Put differently, with insourcing, if Hospital A wanted to achieve the same level of quality of cleaning services as provided by the vendor, the hospital would need to spend an additional UGX 28,618,356.84 ($ 11,007.16). This amount does not reflect real financial savings, but reflects an attempt to place value on quality. Cost-benefit analysis of outsourcing with and without quality adjustment for Insourcing 2014 UGX. A Sensitivity analysis was conducted to test the impact of alternative assumptions (operational costs and management costs) on the results of our cost benefit analysis. The results of the sensitivity analysis are shown on a tornado diagram below (Fig. 1 ). The impact of varying the contract costs by 20% is also plotted for purposes of comparison. Fig. (1 ). demonstrates that the net cost benefit is positive for the scenarios where operational costs and management costs are varied by 20%, meaning that outsourcing is still cost-beneficial. Thus, operational costs and management costs have relatively little impact on the quality-adjusted net total cost of outsourcing cleaning services in our study hospital. Tornado diagram of main assumptions. The diagram also shows that even after varying the cost of the contract by 20%, outsourcing still remains cost-beneficial as indicated by the positive net total cost of outsourcing. However, varying the cost of the contract has a significant impact on the quality-adjusted net total cost of outsourcing. 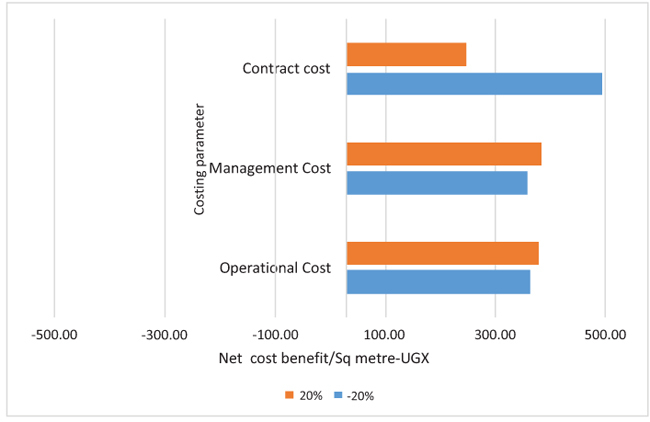 Increasing the annual cost of the contract by 20 percent (from UGX 48, 000,000 to UGX 57, 600,000) decreases the quality-adjusted net total cost of outsourcing from UGX 28,618,356.84 to UGX 19,018,356.84 (34% reduction) while decreasing the cost of the annual contract by 20 percent (from UGX 48,000,000 to UGX 38,400,000.00 per year) increases the net total cost from 28,618,356.84 to 38,218,356.84 (34% increase). Fig. (2 ) presents the quality-adjusted net total cost of outsourcing at different values of the outsourcing contract per square meter cleaned. Through outsourcing, the hospital pays UGX 644.35 (USD$ 0.25) per square meter per year for the cleaning services. 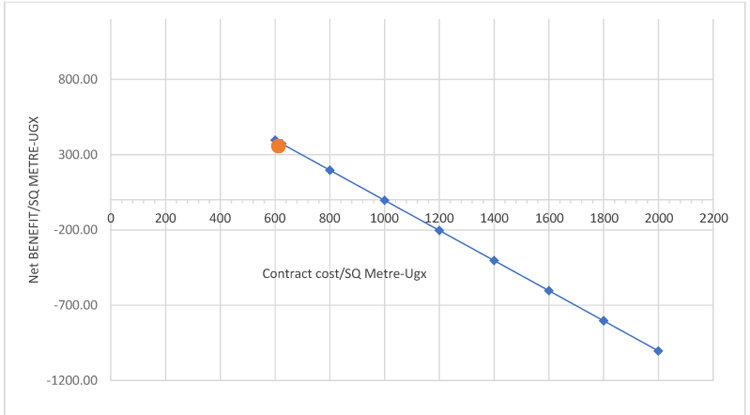 The vertical line demonstrates that holding all other assumptions constant, outsourcing is cost-beneficial to the hospital management only when the annual unit cost of the outsourcing contract is less than approximately UGX 1000 ($ 0.38) per square meter per year. Impact of varying contract unit cost on quality-adjusted total net cost. Given that the manager’s service quality rating had a significant impact on the net cost benefit, we conducted an analysis to determine the quality rating below which outsourcing would not be cost beneficial to the hospital compared to insourcing. Fig. (3 ) shows the impact of the managers' quality of services perceptions on the net total cost of outsourcing cleaning services. The figure shows that the net total cost saving of outsourcing is highly dependent on the managers’ rating of the quality of cleaning services. An increase of one point on the managers’ average quality rating on the Likert scale (from 8 to 9) results in an increase of approximately UGX 9,1195,583.16 in the annual net total cost saving from outsourcing (net cost saving increases from UGX 24,020,565.26 to UGX 33,216,148.42). A decrease of one point on the manager’s average quality rating on the Likert scale (from 8 to 7) results in a decrease of approximately UGX 9,102,458.84 (net cost saving decreases from 24, 020,565.26 to 14, 824, 982.11). For hospital A, an average quality rating of outsourced services below 5 compared to the average rating of insourced services of 4.8 from the mini-survey would result in a negative net cost benefit for outsourcing. In other words, for the current scenario, keeping all other factors constant, for outsourcing in Hospital A to be cost effective, the quality of the outsourced service must be better than the quality of insourcing, though the hospital ends up paying for the outsourced services. Impact of varying outsourcing rating on quality-adjusted NPV. This cost-benefit analysis finds that outsourcing cleaning services at the considered hospital were more expensive than in-sourcing. Just like this study, a similar study conducted in a hospital in Botswana estimated that outsourcing cleaning services in the hospital compared to the status quo, would result in additional hospital expenditures meaning that outsourcing was more expensive than in-sourcing [15Cali J, Cogswell H, Buzwani M, Ohadi E, Avila C. Cost-Benefit Analysis of Outsourcing Cleaning Services at Mahalapye Hospital, Botswana 2015.]. However, both studies show that outsourcing provides a greater value for money to hospital’s managers because it resulted in a significant observed increase in the quality of cleaning services. It can thus be concluded that even if outsourcing was more expensive than in-sourcing, after taking into account improvements in quality, the cost-benefit analysis favors the outsourcing alternative. Not all benefits of outsourcing the cleaning services are measurable in financial terms; other intangible benefits include improved quality of care, improved satisfaction of patients and staff due to a clean environment, among others. A cost-benefit analysis as conducted here is only one part of a complete analysis of the effects of implementing the outsourcing of cleaning services. The study hospital which is a mission (faith based) hospital strives to offer quality service in a clean environment. Thus, outsourcing cleaning services in order to improve the quality of the hospital’s cleanliness are key to the attainment of the hospital's objectives. The analysis shows that the net total cost to the study hospital from outsourcing cleaning services was positive across a wide range of assumptions. The benefits arise from improved quality of cleaning services and reduction in management costs for supervising delivery of the cleaning services. The results of the sensitivity analysis conducted in our study are similar to those of the Botswana study. Just like this study, the Botswana study found that outsourcing cleaning services delivered greater value for money than in sourcing under all scenarios tested. Also, just like in this study, the cost of the contract and the management’s rating of the quality of the service had the greatest impact on the value for money of outsourcing cleaning services in the studied hospital [15Cali J, Cogswell H, Buzwani M, Ohadi E, Avila C. Cost-Benefit Analysis of Outsourcing Cleaning Services at Mahalapye Hospital, Botswana 2015.]. After adjusting for the improvement in quality, the analysis shows that outsourcing of cleaning services though more expensive, delivered higher value for money. In justifying paying more for a better service, however, hospitals must commit to vigorously monitoring the quality of services provided by private vendors, and hold them accountable for their quality. Managers may consider defining quality standards during the contract negotiation phase to ensure that both parties have the same expectations of what constitutes quality services. Hospital managers should then conduct regular quality assessments together with company managers to ensure that expectations are being met. This is important because as revealed in this study, quality rating of the outsourced services has a significant impact of the value for money from outsourced services. The finding that management’s quality rating of the outsourced services is one of the factors with the greatest impact on the value for money of outsourcing the cleaning services raises the question of how much it would cost to improve the quality of cleaning services provided by the hospital staff through better remuneration, training, improved supervision of provision of better equipment and how this would impact the cost benefit analysis. The key to answering this question would be the determination of the cost of the additional investments that would be required by the hospital and how these costs compare to quality adjusted cost savings from outsourcing. As Table 4 shows a scenario where the hospital would need to spend more than UGX 28,618,356.84 on these additional investments would make outsourcing the more cost-effective option. This study was framed from the hospital manager’s perspective to assist in making decisions about the outsourcing of cleaning services. It may also be worthwhile to take the societal perspective, which would include benefits to the community (e.g. employment opportunities for locals in the outsourced company) and patients. A clean environment can contribute to reduced incidence of hospital acquired infections and also improve quality of care contributing to lower costs of health care delivery and reduced costs to those seeking care. An analysis based on the societal perspective would most likely attempt capture these benefits. The time horizon for this analysis was one year. It would be interesting to conduct the analysis over a longer time period to see how that affects the results. It can however be argued that the costs and benefits of outsourcing should improve over time. As vendors continue to gain experience, they are likely to increase operational efficiency through innovation or increased economies of scale leading to better quality services at lower costs. As hospital manager improve their capacity to monitor of vendors and enforce adherence to quality standards, quality of outsourced services could also improve. This study has several limitations. The cost-benefit analysis was based on secondary data reported by the hospital managers. Also, the operational costs and costs of supplies used were provided by the hospital management as aggregate/ total costs for the periods of interest. Details of unit prices and quantities used were not readily available to us. The quantification of the benefits of outsourcing is highly dependent on the results of the subjective services quality mini-survey of the various hospital Managers which reported a 77% observed increase in quality rating of cleaning services after outsourcing (from 4.8 out of 10 before the implementation of outsourcing, to 8.5 out of 10 after the implementation of outsourcing). It would have been desirable to survey other hospital staff e.g. nurses to verify the manager’s responses and further inform the analysis. Despite this limitation, it is likely that the management team’s assessment of the differences in quality of cleaning services during in sourcing and outsourcing is accurate because the management team surveyed is in a good position to assess all aspects of the outsourcing experience, including negotiating with the vendor, monitoring the cleanliness of all areas of the hospital, and monitoring the incidence of hospital-acquired infections. Other potential costs like the costs of negotiating the contract and managing the procurement process were not included in the analysis, because these costs could not be collected. However, they are likely offset by intangible benefits of outsourcing that are also not accounted for in this analysis. Also, the study used financial data as reported by the hospital managers. This can only at best be an estimate and may not be a true reflection of actual costs. Also the costs of utilities were reported as aggregate costs. A better option would have been to determine the quantity of each utility consumed and multiply with the unit prices to obtain the total costs. However, detailed information on unit costs and quantities used was not available. For most hospitals, the decision to outsource is premised on the assumption that outsourcing will provide better quality services at a cheaper cost. However, this is usually based on intuition and is not backed by a thorough cost benefit analysis. This study evaluated the costs and benefits of outsourcing cleaning services in a selected hospital in Uganda. We find that outsourcing is more expensive than in sourcing but also provides better quality of cleaning services. Once service quality is accounted for, the economic benefits of outsourcing become evident. Our findings indicate that a critical factor in ensuring the realization of these economic benefits would be securing a good contract price during negotiations with vendors. Conducting a cost-benefit analysis as done here can help hospital managers determine the contract price beyond which outsourcing is no longer cost beneficial. For successful outsourcing hospital managers should collect more-detailed information on the costs of providing nonclinical services in-house, and more information on the monetary value of increased quality of outsourced services. This information will allow hospital managers to conduct rigorous cost-benefit analyses of outsourcing cleaning and other services in their own context. The Medical Superintendent and Hospital Administrator of the hospital provided consent for their participation in the face interview with the researcher and for sharing financial and other data related to the hospital’s outsourced cleaning services and the outsourcing process. We would like to thank the Medical Superintendent and Hospital Administrator of the study hospital (who will however remain anonymous) for taking the time to participate in the face interview with the researcher and for sharing financial and other data related to the hospital’s outsourced cleaning services and the outsourcing process. We are also grateful to Dr. Jaume Puig-Junoy for his review and comments on the article. Liu X, Hotchkiss DR, Bose S, et al. Contracting for primary health services: Evidence on its effects and framework for evaluation 2004. Health Sector Strategic and Investment Plan 2010/11-2014/5 2010. Corby N, Nunn M, Welch K. Addressing the Need: Lessons for Service Delivery Organizations on Delivering Contracted-Out Family Planning and Reproductive Health Services | Primer 2012. Perrot J. The Role of Contracting in Improving Health Systems Performance 2004; 62. Mills A, Broomberg J. Experiences of contracting health services: An overview of the literature 1998; 60. Cellini SR, James Edwin Kee JE. Cost-Effectiveness and Cost-Benefit Analysis.Handbook of Practical Program Evaluation 493-530 3rd ed. 3rd ed.2010. Cali J, Cogswell H, Buzwani M, Ohadi E, Avila C. Cost-Benefit Analysis of Outsourcing Cleaning Services at Mahalapye Hospital, Botswana 2015.